I’ve been there. I’ve walked through Williamsburg or Ft. Greene, glanced at the large brownstone windows and whispered the affirmations: I will move to Brooklyn. I will write from a nook, adorned with a desk and MacBook, and glance out on the bustle from a bay window. I will meet a Dre or some tone black Afro-Caribbean man who’ll bring me Starbucks for restlessness and keep my place in bed warm until I sneak in during the wee hours of the morning. You could taste that “Brown Sugar” couldn’t you? From that cold night in a movie theatre, watching the movie’s protagonist place books on her vibrant shelf, I knew Brooklyn was for me. Although I was born in Flatbush, the heart of the borough, I was uprooted at nine for a chance at better schools. My family and I moved to Long Island, NYC’s suburban area. Every chance I got; I made a mad dash on the LIRR to hang around my grandmother’s home on Schenectady Avenue. I was a Brooklynite at heart: bare feet on tar and concrete in the summer heat, sliding Freezies on my tongue, drowning the remaining ice in C&C fifty cent sodas, and ciphering almost-sixteens on the steps with my boy cousin’s friends. This is where I belonged. Two nights ago, I finally moved back. After tenure at a college in silent Virginia and a bout back home with the parental units, I finally have something within New York City to call my own. 1) You should start saving. Some people have this illusion that the minute you step on the pavement of NYC, fame and fortune will come to you and record labels, publishers or their new corporate job will take care of the rest. Nope, not at all. Create a budget projecting how much you’ll need to spend each month, make each month and save each month. Start off with a savings of about $3,000-5,000; this will help when fending off rental broker fees, hunger pains and tips for overeager food deliverymen. 2) You’ll need a secured gig. This economy is no joke and even if we were still in the Clinton era, you’d still need a job the minute you get here. Unless you have family/friends that are willing to let you sleep on their couch or in the guest bedroom; don’t speed here to start looking for a job the next morning. Even with a start off fund, you’ll need a gig to keep your head above water. Shoot freelance queries to blogs/publications for some extra side money, apply for NYCDOE certification if you’re taking the substitute/teacher route or find something that’ll keep the lights on until you’re discovered. 3) Don’t wait to be discovered. While keeping the lights on, make serious connections. There are plenty of conferences, events, rare bookstores, open mic spots and more in NYC. Our kind dwell here. Just look for someone with hipster clothes, a MacBook and “I’m-working-on-my-novel” plastered on their face. Networking and surrounding yourself with positive goal oriented persons is the one of the fastest routes to the top. a. Brooklyn: Ah, you know how I feel about the county of kings. Let me shake my bias off for a sec. Okay. This borough is the epicenter to all other boroughs, except for Staten Island. It features gentrified writer indulgent areas like Williamsburg, Ft. Greene, Brooklyn Heights and so much more. 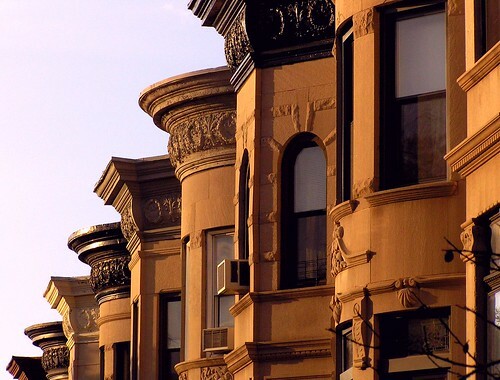 Other up and coming areas include: Crown Heights, Bedstuy (Stuyvesant Heights) and some areas of Flatbush. b. Manhattan: Enjoy the madness of the city life? This is where you need to be. Featuring areas like Soho (Bohemian), Uptown (Harlem Baby! ), Lower East Side (Artsy Fartsy) or super savvy Chelsea. c. Queens: If you prefer more sightings of trees versus skyscrapers, head out to the QB. Long Island City features hot clubs, unique restaurants and eons of beer gardens; it’s the new twenty-somethings’ heaven. d. & if it wasn’t for the Bronx...If you’re working out in Harlem or the city and want to find something a little less expensive, BX has got your name all over it. I don’t know much about the upcoming areas here. Research, research and more research. e. Staten Island: If ferries and bus rides in heels/suits are your thing…by all means. However, no one really goes to Staten Island. NO ONE. 6) Utilities included. I love seeing that in an ad. The truth is it’s rare. Remember, when you’re crafting your budget, you’re not only paying for rent. Factor in light, gas, heat, water, food, cellphone, cable/internet and outings as well. 7) The MTA is a lifesaver. When I went away to college, it agitated me that everyone knew I was a New Yorker b/c I didn’t drive. I immediately got my license and got a car to prove all of my classmates wrong. When I got back home I knew that I’d be zipping around in my vehicle, while my friends were still walking. All I encountered was traffic, traffic and more traffic. My advice is, take the train. I’ve shown up a half an hour late to most functions when the train would’ve taken me there pronto. Grab a weekly or unlimited MetroCard it’s worth it. Apps & websites like Hopstop or Mapquest can help you find your way. 8) If you see something, say something. After a week on the train you’ll see this and understand the phrase entirely. Be careful when walking late at night in certain areas, keep your belongings by your side in the train and look both ways before entering your home too late. The city can be great, but all cities have their flaws. 9) Be smart about your money. New York is flooded with ways to spend your money. Food, books, purses and specialty stores litter the streets. Keep that wallet in the bag and treat yourself every once in a while. The more you save, the more you can advance your environment here. There are tons of free events that just require RSVP’s, libraries with awesome books and Living Social deals that will have you dancing on the 1 on the way home. Frugal it up! 10) Write. In all the chaos of the city and its benefits, we sometimes forget what we came here for. Grab that journal/computer once a day and work to your heart’s content. Set goals, create vision boards and grab a planner for deadlines. Your pen’s future awaits it. On Saturday night, I let go of my vision of being Sidney Shaw. As I unpacked the boxes, I suddenly stopped and stood still. I took in a breath of fresh paint and cardboard. I whispered my successes: I live in Brooklyn. I can envision a white desk and Moleskins in our tiny extra room. I am home again. I am safe. This morning I walked into the bustle with a smile. You know, sometimes I wish you would stay out of my blogger drafts, okay! lol! I'm in the process of writing a post similar to this (though of course not a writer's guide to moving to BK but more geared toward on women's finances). I have a huge smile on my face right now, you go girl!! Congratulations! This is an excellent post, Riv. I think that if I was going to move to BK, I'd certainly be thinking about things that I wouldn't have thought about before. P.S. What about Canarsie? Been in that area a few times...thought it was pretty nice. You're living the dream. Embrace it. Breathe it. But above all, make it count. You got this! Seriously though, this was helpful and got me even more excited as I chip away at this grad school application. I'm excited about the possibilities and can almost feel that same satisfaction you felt as you unpacked. Congrats sis! Live your dream, babe!! LOL @ Staten Island... NO ONE. I don't quite fancy myself a New Yorker, but I bet this would be alot of good advice for any young writer moving to a new city. Kudos!